Auli is considered among the best skiing destinations of India, it is situated in Chamoli district of Garhwal region covering an elevation from 2,519 mts to 3,050 mts above sea level. Auli is a “Bugyal” which means meadow in the regional language, these green Bugyals turn into a sheet of white during winters. Auli is often compared with best ski resorts of the world by the foreigners and has also hosted the First SAF Winter Games in the year 2011. Being blessed with invigorating views of the splendid mountain range of Himalayas, the slopes of Auli provide enough thrills to professional skiers and novices alike. GMVN conducts a 7 day and a 14 days skiing course at Auli and special provisions for day tourists are also available. The conditions for skiing are perfect at Auli. A 500 mts long ski-lift and an 800 m long chair-lift links the upper and lower slopes. The Garhwal Mandal Vikas Nigam Limited takes care of this resort and they have imported snow beater to maintain slopes. Walking through the misty slope provides one with the imposing spectacles of some of the lofty mountain ranges like Nanda Devi, Mana Paravat and Kamat. The best time to visit Auli is throughout the year except monsoons. But if you want to enjoy the eternal bliss of snow then visit Auli from December end to March. If you are planning a visit to Auli in winters then tourists are advised to bring heavy woolens, caps, socks, gloves, mufflers, pullovers, trousers, wind proof jackets, sunglasses, snow boots, torch and a whistle for personal use. Auli is situated at an altitude of 2915 mts – 3049 mts is an important ski destination in the Himalayan mountains of Uttarakhand, India. In fact some French and Australian experts consider Auli to be one of the best ski resorts in the whole world. Auli is where impeccable natural vistas of mighty peaks are studded with huge mountainous trees creating a fabulous scenery that compels compulsive travelers to set on Auli Tours repeatedly. Auli is less known ski destination than Shimla, Gulmarg or Manali. Auli lies on the way to Badrinath. Auli is blessed with a breathtaking panoramic view of the lofty peaks of the greatest mountain range in the world, the Himalayas. Auli also boasts the Asia’s longest – 4 km Cable Car – Ropeway (Gondola). It also has a Chair Lift and a Ski-Lift. Apart from Skiing there is an interesting trek route also. There is a training facility of Indo-Tibetan Border Police. Auli is known as ‘Bugyal’ in the regional language which means meadow. A small temple having connection to great epic Ramayana is also present. The place Auli is surrounded by the mighty peaks of Himalayas. Most of them have some name of goddess or some mythological connection. The one that stand out is beautiful Mt Nanda Devi which stands 7,817 Mts (25,643 ft) in height. Even the Mt Neelkant visible. Auli lies in the way of the Badrinath route. So in winter there is a heavy snow fall in Badrinath and the temple is closed for 5–6 months. During this period the deity of Lord Badri Vishal is brought and kept in temple at Joshimath. This is golden chance for Hindus and not to be missed. In Auli there is a small Hanuman temple having some connection to Ramayana. The belief of people is when Laxman, younger brother of Lord Rama got injured fighting the Rakshas in Lanka (Sri Lanka). A medic ordered that only the herb name ‘Sanjivani’ found on Sanjivani mountain in Himalayas can save Laxman. Lord Rama ordered Hanuman the task. Hanuman flew from Lanka and during his way to Sanjivani mountain he took some rest in Auli before continuing his journey. Auli is located at 30.32°N 79.36°E in the Chamoli District of Uttarakhand, India. Auli is becoming a popular spot for Adventure. 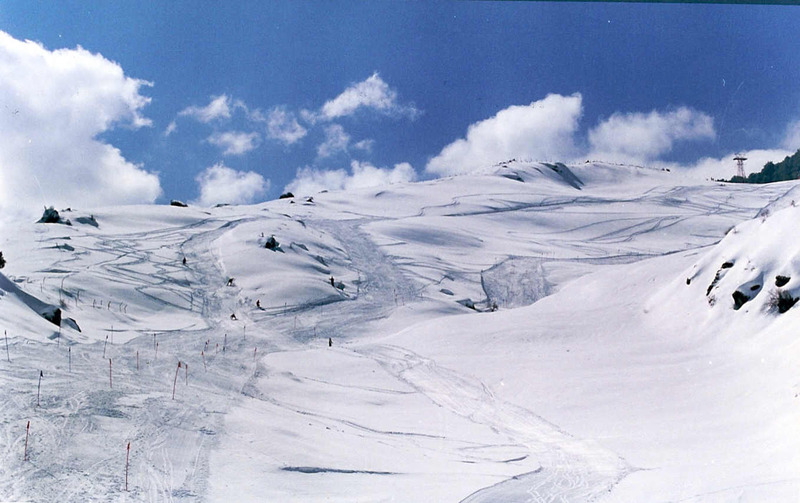 Skiing is a major pastime in Auli. Facilities for skiing are available from GMVNL. There are certificate and non certificate course provided ranging from 4 days to 14 days. The courses includes stay, food, ski gear charges and guide. There are local people who provide Ski Equipment for the casual tourist and also help them to ski. If you have a weeks time, then it is possible to enroll in Ski courses and learn from experts. Auli is a picturesque destination the best time to visit is last week of Jan to first week of March for skiing. Though weather is highly unpredictable. Auli has a cool climate all through the seasons. Summers (March to June) are very pleasant with moderate climate, with average around 15°C. Summers is ideal for all sight seeing, skiing and also for visiting nearby attractions.Monsoons (July to October) are accompanied with scanty rains and also temperature drops down to 12°C. Winters (November to February) are chilly days with average minimum touching near 4°C. Minimum can touch sub zero levels (-8°C). Snow falling seen very often during winters. These months are perfect for travelers liking chilly climates. The best season to visit Auli is all through the year. Tourist attraction in Auli is Snow Skiing and is best during November to March. May to November offers cool and pleasant climate and the right period to spend relaxing moments in the outdoors. December to February is snow bound and chilly. Keep winter clothes to cover up the body if opt for a visit during this period. This period is ideal for snow skiing. March and April are very pleasant and perfect for all sight seeing and outings. April is a good month to visit Auli. Moderately Cold Weather: Moderately Cold Temperature varies from 7°C to 17°C. April is cold but perfect for all tourist activities. Day times are bit warm, but nights are cool. Auli is about 300 kms from the Soulitude in the Himalayas and it takes around 6 hours 38 minutes to reach there.